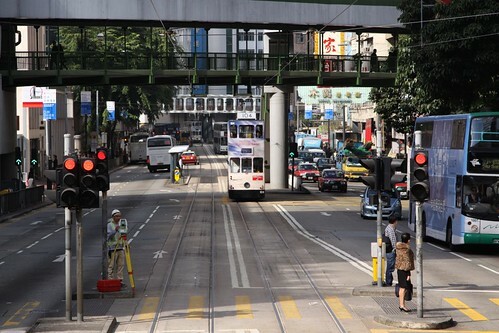 The other day I had a quick look at the Hong Kong Tramways, while today I am going to have a look at the more operational details. First up is the signalling used, or lack thereof. 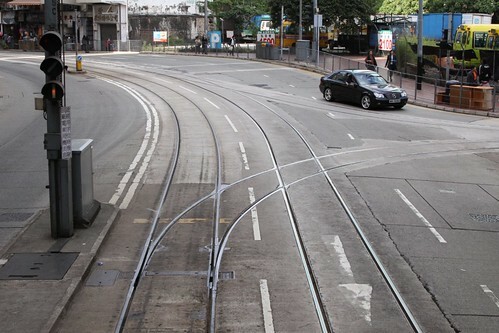 The entire network consists of on-street running, with no reserved track apart from some sections of dedicated tram lanes on road, so each driver need only maintain separation from the tram in front visually. 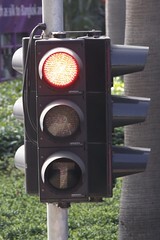 At pedestrian crossings or road intersections standard traffic signals are used to direct trams, but with dedicated tramway aspects displayed. 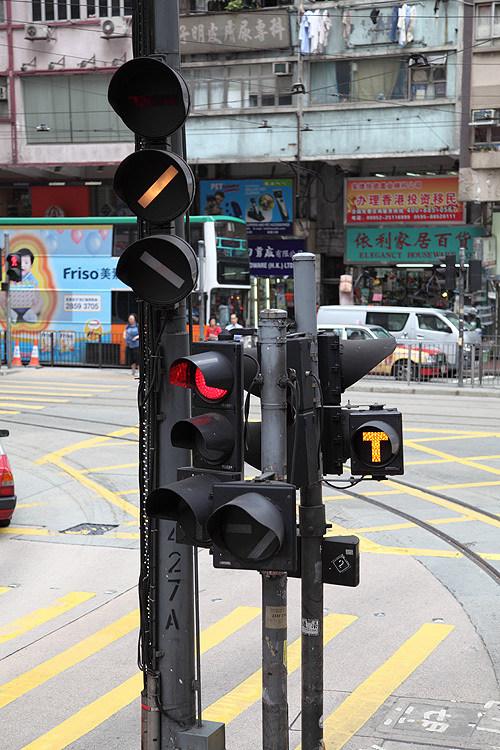 Signals for trams use the same phases but the green is replaced with an amber ‘T’, to prevent car drivers from being distracted by a signal that does not apply to them. 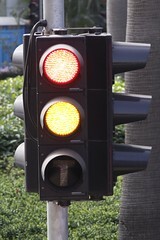 In Melbourne the same logic applies to tram-only traffic signals, but a white ‘T’ is used instead. 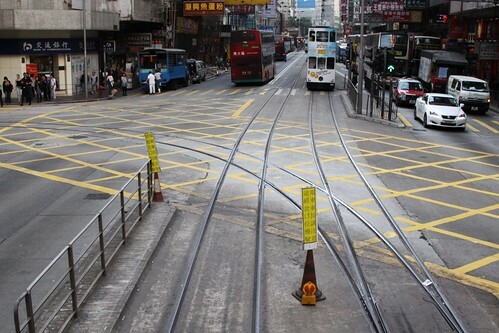 Intersections such as the one below show how a motorist could be distracted by the tramway signals. The other infrastructure item of note is the control of points at junctions. For trailing points nothing is needed as trams can pass through without interruption, other than some signs in Chinese that I don’t understand. Also around the network are a handful of trailing crossovers, which are presumably manually operated by a point bar inserted into the mechanism by the driver. 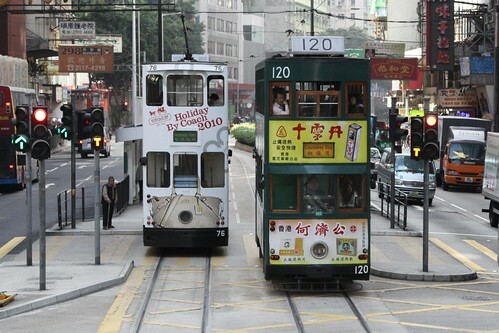 These crossovers are not used in revenue service, due to Hong Kong’s tramcars being designed for a preferred direction of travel. The final case is facing points located at intermediate termini, route junctions or depot entrances. Due to the number of trams using the network and a multitude of destinations, facing points are all power operated by drivers from their cab, using a system that looks identical to that used on the MTR Light Rail, which itself looks very similar to the V-Tag system used in Melbourne. Again the two cities use the same aspects for their route indicators, except Melbourne uses a horizontal bar instead of Hong Kong’s white lamp. 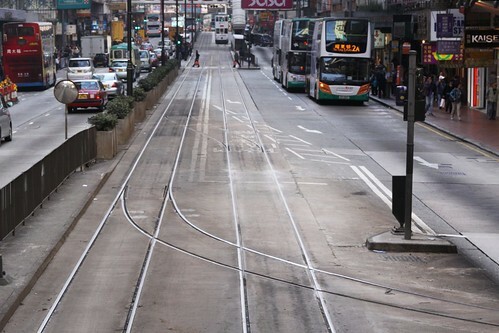 In all Hong Kong Tramways seem to have a lot in common operationally with Melbourne’s network, despite the gauge difference and the double-deck tramcars. 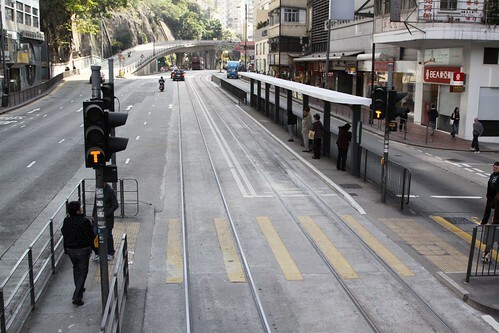 This entry was posted in Transport and tagged Hong Kong, Hong Kong Island, Hong Kong Tramways, light rail, rail operations, railway signalling, trams. Bookmark the permalink. I’ll go ask one of my relatives to see if I can figure out what the signs says. I’m guessing they are cautionary notices of some sort. It is interesting that the Hong Kong Tramways’ internal signage is only in Chinese, while the MTR uses both English and Chinese on their network. One explanation is the age of the companies, the tramways date back 100 years, but the construction of the MTR and the modernisation of the KCR dates to British consultants back in the late 1970s. Having mentioned this to a relative, I may have an answer to that. It may be also something to do with the fact that traditionally, no “foreigner” as it were ever went into the tram driving industry so all internal signage was designed as such. Apparently the sign says something along the lines of “Tram drivers must be careful and move slowly along these points/turning.” We weren’t sure how they would be translated officially but that is what my relative made out the sign to say. The top bar is red in colour, not white. Inside the cabs it appears there was one unlabelled switch which very similar to the Z/A/B class trams switch in Melbourne, which I assumed was for the points control. In addition to the points being changed, the overhead has a switch-able frog, connected by a cable and pulley system to the points themselves. The only other signalling I noted was a departure signal from the terminus. Thanks for those extra details Chris, it looks like next time I am in Hong Kong I will have some more items to follow up! 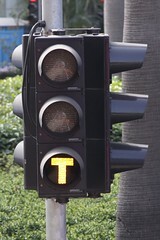 The photo of the signal looks like the ‘T’ junction on the exit from the Happy Valley loop. The switchable frog is an interesting inclusion to the overhead, I presume it makes dewiring an infrequent occurrence, a huge benefit given that the trolley pole is so high up. Thanks for that – so simple!